Real estate professionals play a critical role in helping customers navigate the home buying and selling process. An important part of the process is ensuring that buyers are fully aware of any hazards in the home, including radon. By learning radon basics, real estate professionals can avoid potential delays liability problems. The Environmental Conditions portion of the Colorado Seller’s Property Disclosure Form specifically lists radon as a hazard that must be disclosed if known by the seller to exist or ever have existed. This is true even if previous test results were less than 4.0 pCi/L. Sellers should provide copies of any test results. The source for radon entering a building is generally just beneath the building. Soil can vary from building to building, even within the same neighborhood. Therefore, the decision to test should not be based on test results from adjacent homes, zone maps, or survey maps. Instead, it’s best to encourage every buyer to test for radon. Radon concentrations vary with season and occupant behavior; however, radon tests at the time of sale identify the potential for elevated radon, regardless of the living patterns of the inhabitants. Radon professionals are trained to identify radon potential so that buyers can be reasonably confident that, if the radon potential is low, the levels will be low when the home is normally occupied and on a long-term basis. This type of testing (short-term) usually takes 2-7 days. Although radon testing can be done by the homeowner, the test may be suspect if not performed by an objective third party such as a radon measurement professional. And, such professionals are trained to identify radon potential, regardless of the season or occupant behavior. Find a certified radon testing professional. Make sure an approved measurement device is used from a qualified laboratory or manufacturer. Continuous Radon Monitor (CRM) testing method involves a single electronic monitor placed in the lowest potentially occupiable portion of the home for a minimum of 48 hours. The monitor reports results in hourly increments to identify unusual swings. Decisions are based on the average reading of the hourly reported results. Ensure your measurement professional is using an approved monitor and follows the calibration requirements for their equipment. Simultaneous testing method involves placing two passive test devices four inches apart in the lowest potentially occupiable portion of the home for 48 hours. This allows the tester to safeguard against errors. Sequential testing method involves two devices placed in the lowest potentially occupiable portion of the home for 48 hours, one after the other. The average of the two test results forms the basis for decision. 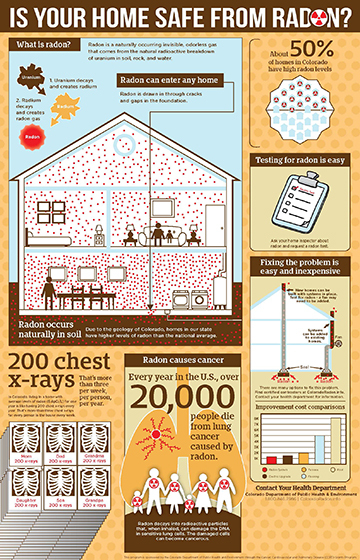 There is no safe level of radon exposure. The average national indoor radon level is approximately 1.3 picoCuries per liter (pCi/L) of air. Homeowners should consider fixing homes between 2.0 and 4.0 pCi/L. Radon mitigation can be simple and inexpensive. When contingencies are written on radon, cite an acceptable level, such as the EPA’s action level of 4.0 pCi/L and, even before the testing is conducted, discuss whether mitigation is an acceptable method for removing the contingency.